Companies and brands that have embraced a philosophy of continuously improving Customer Experience (CX) are leading the way in every sector of the marketplace. The CX landscape is constantly changing and evolving. To ensure you're adapting and meeting your ongoing ROI efforts, it’s critical you establish the appropriate metrics to determine a performance baseline. Optimizing your performance is dependent on obtaining rich data on what your customers want and how well your support works – accomplished with great efficiency and an even better return on investment. Here are several metrics to consider that are commonly used by mature CX companies to measure their Customer Experience effectiveness. Customer Effort Score is a key CX measurement acquired by asking the customer how much effort they had to expend to get their problem solved. Conducting CES surveys are a simple method of allowing organizations to identify aspects of the Customer Experience that are frustrating to their customers. They are typically sent to customers after a support event has taken place. 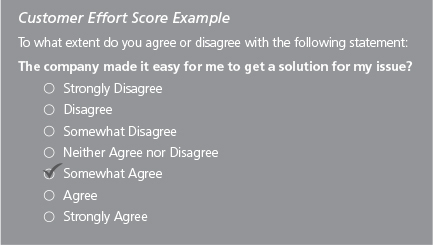 They are scored on a Likert Scale that asks respondents to choose their level of agreement or disagreement to a series of questions. Negative responses to these types of questions represent obvious opportunities to increase CX and improve the use of organizational resources to affect better outcomes for customers. Positive CES scores will not always translate into enhanced customer loyalty. For example: if a customer feels that it is easy to interact with your company but has to contact you multiple times for the same issue, this could contribute to a higher churn rate. Net Promoter Score is measured by asking customers a single question: "On a scale of 1 to 10, how likely are you to recommend us to a friend or family member?" Customers who respond with a 9 or 10 will consistently promote your company. Respondents who answer with 7 or 8 can be considered neutral. Those who select a number between 6 and 0 are considered to be detractors of your brand who will share their negative experiences. NPS scores are considered a high-level metric because you are asking the customer to summarize the grand total of all their experiences with your organization. If your brand is looking to embrace improvement in overall CX, then deploying this type of NPS question is an effective place to begin to understand how your customers feel about your company. Customer Satisfaction is similar to CES in that it is often utilized after a customer support event or purchase. CSAT surveys can be constructed to be relatively simple and quick to create the greatest likelihood that a customer will take the time to respond. This could easily be comprised of a general question about their level of satisfaction followed by an open-ended question asking "Why?". CSAT scores provide valuable data to determine if your support agents require additional training. The data can also be applied as a means to measure if your efforts and investment in on-going education for your personnel are paying dividends and contributing to continuous CX improvement. With the vast number of consumers interacting with products and services via mobile devices, an effectively designed CSAT questionnaire can give an organization timely, real-time and actionable feedback on an ongoing basis. Why Not Average Handle Time (AHT)? There are conflicting philosophies regarding the use of Average Handle Time as a Customer Experience KPI. For many years, AHT was the most important measure of efficiency in customer support centers. Time is money and, the faster agents can complete one call, the sooner they can move on to the next. This creates an obvious paradox as it applies pressure to Customer Service Agents to move through a support call quickly at the expense of providing the most complete and comprehensive resolution to a customer’s issues. AHT should not be dismissed entirely as an important measure that contributes significantly to overall CX. The manner by which Average Handle Time data is interpreted is a distinguishing factor for successful CX companies in establishing market differentiation. To optimize efficiency while meeting and exceeding customer expectations, there needs to be a balance so agents spend enough time carefully listening to the customer’s needs, identifying all their outstanding issues, determining the resources needed for resolution and proficiently take the necessary actions to meet and exceed the customer’s expectations. Companies that fail to strike this balance are creating a service culture in which agents are watching the clock and failing to create the level of engagement necessary to completely satisfy the customer on a single call. Customers do not want to spend 10 minutes on a call for a simple issue that should only take 2 minutes to resolve. It’s simply about understanding the customer and knowing that issue resolution is of the upmost importance, regardless of the time spent and with the knowledge that every interaction contributes to enhanced loyalty and profitability. Deciding which key metrics are important to your ROI can feel like a daunting task when creating a holistic CX strategy for your organization. The metrics in this article can be an effective starting point to establishing your very own Customer Experience benchmarks and pinpointing the measurements that are most critical to your enterprise goals. Everyone is aware of Zappos’ unique approach to Customer Experience. It’s earned them world-wide acclaim and made them a benchmark for customer-centricity. Their success is due in large part to the abandonment of some usual operational metrics like Average Handle Time. Service operators are trained to build trust at every connection, sacrificing cost efficiency in call handling. They go to great lengths to ensure customer satisfaction, including researching competitor websites and directing customers to other retailers when their own products are out of stock. Operators have been known to remain on a single customer call for hours to ensure the customer need is met. The end result – increased lifetime value of the customer. "One of the best ways to enhance your support and provide an exceptional Customer Experience is to clearly understand what your customers want and need from your company. This starts with defining your key performance metrics and establishing benchmarks for success."